Is there anything worse than being left behind? Seeing your flight taxi away from the gate JUST as you arrive, huffing and puffing, and sweating after deplaning from your last flight and going all out to make your connection, all for naught. Being the last one picked for teams in PE, as you hope no one notices the hurt you’re masking with a smile or too loud a laugh. Watching your mom pack dishes in newspaper as your dad packs his bags. Hearing that the parents you’ve been counting on bringing you to America for the last 2 years aren’t, in fact, coming after all. I think being left behind, whether physically or emotionally, is one of the hardest, loneliest feelings in the world. In fact, a friend reminded me the other day that Satan often uses isolation and loneliness as a tool to fool us into thinking that we’re unlovable, not worth anyone’s time, and certainly not worthy of God’s attention and love. Of course he does. God says we’re made for Him and for community. God LIVES in perfect community with Jesus and Holy Spirit. God says love Him and love others by living with them and putting up with their (filter, Gretchen) junk. So yeah, it only makes sense that the deceiver would tell us that we’re worthless and should think ourselves lucky if anyone loves us – even a little bit. Have you ever fallen into believing that lie, just for a moment? I know I have. And darn it, even as a grown up, maturing follower of Jesus, I’m tempted to believe that tripe; and have to discipline myself to be in the Word, in prayer, and with a community of other believers, so that I don’t forget the truth. There’s a verse that is oft used in Christian adoption circles, and I love it, but I’m just now learning of its full meaning. Jesus says, “I will not abandon you as orphans—I will come to you.” John 14:18 (NLT). Jesus. Not Gretchen or her husband or anyone else. Jesus. And how will He come to us and to those precious girls and to anyone else who believes in Him? He sends his Holy Spirit to live in those who love Him. According to my study Bible, Holy Spirit is described as our Counselor (less as therapist and more as truth teller), our Comforter (think: encourager), and our Advocate (someone who is on our side and for us). 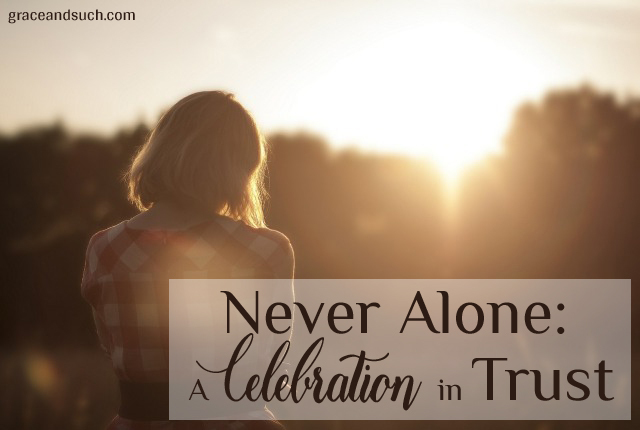 The absolute truth is that those who love Jesus are NEVER alone. We just aren’t. Not only do we have God living in Heaven, who sees us and loves us and is with us. We have Jesus, who came to earth, to reconcile us to God, and who was raised from the dead, showing God’s power over the ultimate separation – death! Furthermore, He is our High Priest, advocating on our behalf to God, the Father, and…Holy Spirit – one third of the actual triune Godhead – was sent by Jesus to make sure we knew that we were, in fact, never alone. Never picked last. Never abandoned. If ever there was a reason to celebrate, it’s this: God loves his children so much that he made sure we would never be alone. When we watch our plane taxi away from the gate with disappointment in our hearts, he is with us. When we are picked last, not promoted, not hired, we know we’re never last in His eyes. When we say goodbye to relationships on earth, we know that though life here is hard and broken and ugly, it’s also beautiful and raw and exhilarating, and we are comforted by knowing we have relationship with Him forever. We may leave others, but those who love him will never be left behind by Him. He loves us so. Oh, how he loves us. Gretchen!!!! Wow! There is so so so much stuff, good stuff in here. You first had me at “community.” I’ve been thinking on the idea of it, longing for it, for awhile now. Last year was kind of a year of focused solitude for me but now I’m ready for the crowd. Husband and I went to a new home group last night and instantly, I knew: This group is special. I don’t know them, but I love them already. I belong here. And then you told your almost-adoption story. Gahhhhh! How devastating! A pastor told me once, “Expectations are everything.” He said it’s better to not have them because when they’re not met? Sadness and woe! You EXPECTED to get those darlings. They expected to get you? I cannot imagine that pain. Diane, thank you so much for stopping by to tell me how my post spoke to you. ? I can only imagine having a child on a mission trip that far away… One of my best friends has a daughter who is a missionary in Australia. She often jokes that if she would’ve known that God was going to take her daughter so far away maybe she wouldn’t of trusted him so much with her life. 🙂 Of course she does trust Him, & her daughter is doing magnificent things in the name of Jesus, but man! Hard for a mama’s heart. Community is hard for me, because even though I like being with people, there is a huge part of me that doesn’t like being with them–because the problem with people is people. 🙂 But then I must remember that I am a people too. And the only way to make disciples is to actually be one. 🙂 Currently, I’m facilitating a group of young women, & I love it. “…though life here is hard and broken and ugly, it’s also beautiful and raw and exhilarating, and we are comforted by knowing we have relationship with Him forever.” I had to wait a few before I could respond because my heart just broke apart in so many pieces for you. Jen has told me of this, and shared your story while you battled the powers that fought against you. I prayed and cried for you then, as I do now. But we are never alone, and somehow that seems to make the pain more palatable, not gone, but somehow easier. Without Him, can you only imagine? Thank you, Diane, for your precious words of empathy & encouragement. Ever so grateful to be walking alongside you, as well. Thank you for being my people. Anytime this song is sung at worship, the words ‘loves like a hurricane’ get me every single time. Being a gulf coast girl, I lived through several hurricanes where we had to take shelter from that storm, and to know he loves us in that big way…. Your girls, living where they are, and where they are not, I can’t imagine how they must feel, but there’s that hope they had, that they were wanted, that they were prayed for, and even though God didn’t bring it to pass, they can know how desperately you and your husband wanted them. And that’s something. Loved, loved reading these words from your heart. Thank you, Amber…God sure is big. Even in these and other hard, hard times. I’m learning so well of His grace’s sufficiency at all times. Moving around in the military is hard, since as soon as you make friends, either they are moving or it’s my turn again. It becomes this chronic aloneness that is gut wrenching and heart wrenching, but Jesus. Jesus never gets lost in a box, misplaced by packers, or moves to the opposite side of the planet like, say, a best friend. The same God is here, in Hawai’i, in Germany, and even in the remote base in Louisiana where no one wants to go and no one wants to leave. He doesn’t change and He wants me to keep after His business. It may look a little different here than it does there, but I needed to remember that I am His here or there, He IS HERE as much as He was where I last felt Him, no matter how distant He feels. I think that might be my favorite line, too, Jen. Love you to the moon and back. I needed this today. I feel like God is really bringing me to the next level, and yet I feel lost. So much of my safety comes in Jesus, but when I look at my circumstances, I forget. No, I am not alone and orphaned. God loves me. After a really crappy day so far, I mean BAD, I am going to rest in this. Well, rest and jog for a coffee. That works. GRETCHEN!!!!!!! LURVE YOU!!!!!!!!!!!!!!!!!!!!!!!!!!!!!! !